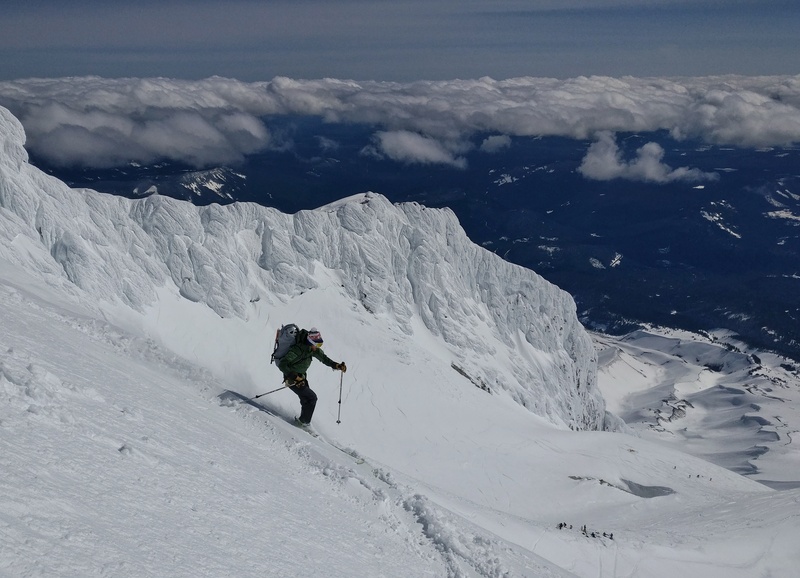 The opportunity arose to climb and ski an iconic Pacific Northwest volcano: Wy’east, more commonly known as Mount Hood, in Oregon. 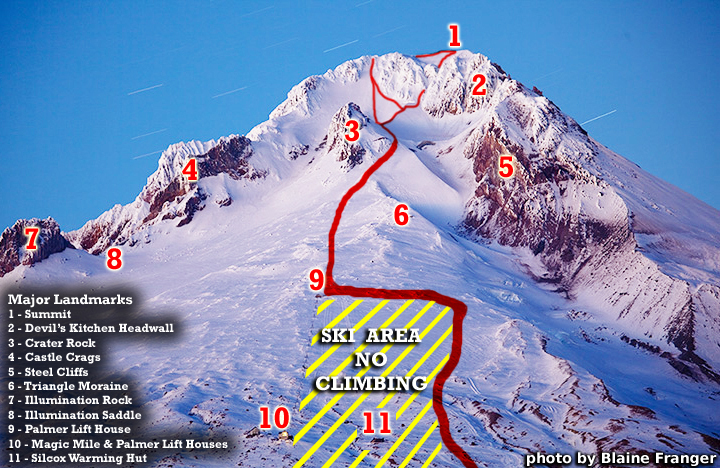 Standing slightly higher than 11,000 ft (3400m), Mount Hood is is a potentially active stratovolcano, which constantly steams noxious gases from fumaroles. Rarely will I pass up an exciting adventure such as this which can be accomplished in your standard long weekend – it had to be climbed! My partner Ian and I planned for the third weekend in April to fly to Portland, keeping all fingers and toes crossed that the weather would line up. Fortunately, in the days before the trip the weather was shaping up perfectly for an ascent on the Saturday and we were getting psyched! We packed our climbing and skiing gear in anxious anticipation and showed up extra early at the airport on Friday. We arrived in Portland just fine that afternoon. Unfortunately, our ski bag did not. And, based on our weather window we were needing to make our summit bid the next day, ideally starting at 4:30am. Air Canada gave us every excuse and explanation but figured out a way to get our bag to Portland later that night. It would arrive at 10pm. OK – not ideal as we wanted to be in bed before that, but we waited around anyway because we needed that bag! Unfortunately, the bag never came on that later flight, either. Tired and frustrated we drove to Mount Hood late that night feeling defeated, until the hotel agent suggested we visit a shop nearby which rented backcountry gear. Hope! But the shop wouldn’t open until 8am so we’d have to roll with the punches and give up the idea of an “alpine start”. As promised, the shop rented backcountry gear but the setups were less than ideal. Ian’s rental gear was old and heavy, and my feet are so tiny that they didn’t have touring bindings small enough for my boot size, so I had to take a resort setup with an additional bulky Alpine Trekker system. Finally, we were on our skis by 10:15am, almost 6 hours later than hoped; likely the last party to start the ascent on Mount Hood that day. But – we were finally moving! Our new plan was to make it as far as we could provided conditions stayed manageable and the snowpack didn’t start to feel sketchy. 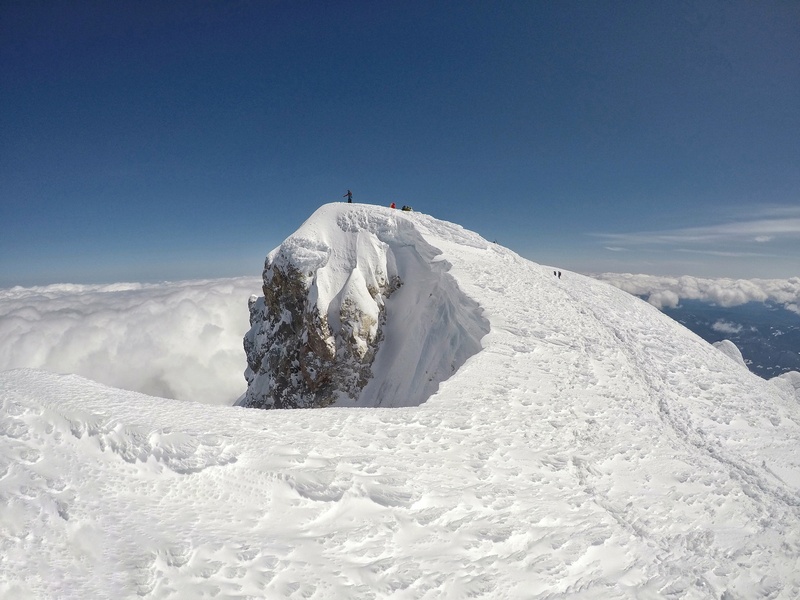 We weren’t necessarily dedicated to summiting anymore. We steadily ascended through the Timberline Lodge Ski Resort. 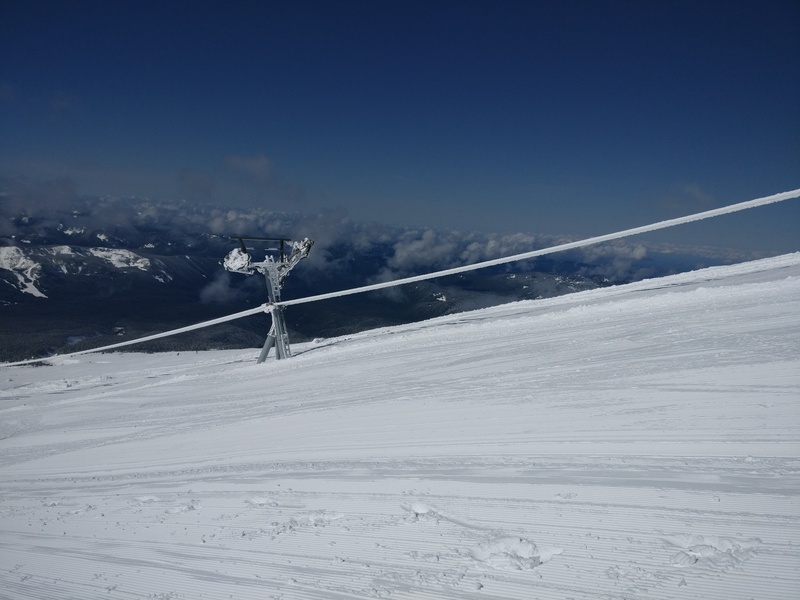 The highest ski lift was closed and almost completely buried by snow this late in the season, after a big snowfall year. I found the climb was not too steep or challenging, just constant. Not too long after leaving the resort boundaries we passed the “steel cliffs” and caught a whiff of dizzying sulfurous gasses spewing from the mountain. After passing the main crater and crater rock, we took a short break and ran into one half of a duo we’d been following online for a while – Corie of Mountain Refugees. Rather serendipitous given they had actually emailed us much of the beta we’d needed to climb Mount Hood, and nice to meet in person (thanks for all the info, guys)! Following our quick break, the climb became too steep to ski up, so we tied our skis to our backpacks and fastened our crampons to our boots for the remainder of the climb up the “hogsback” and through the “pearly gates”. Apparently the pearly gates were quite filled in this year due to all the snow, making them easier to climb up. 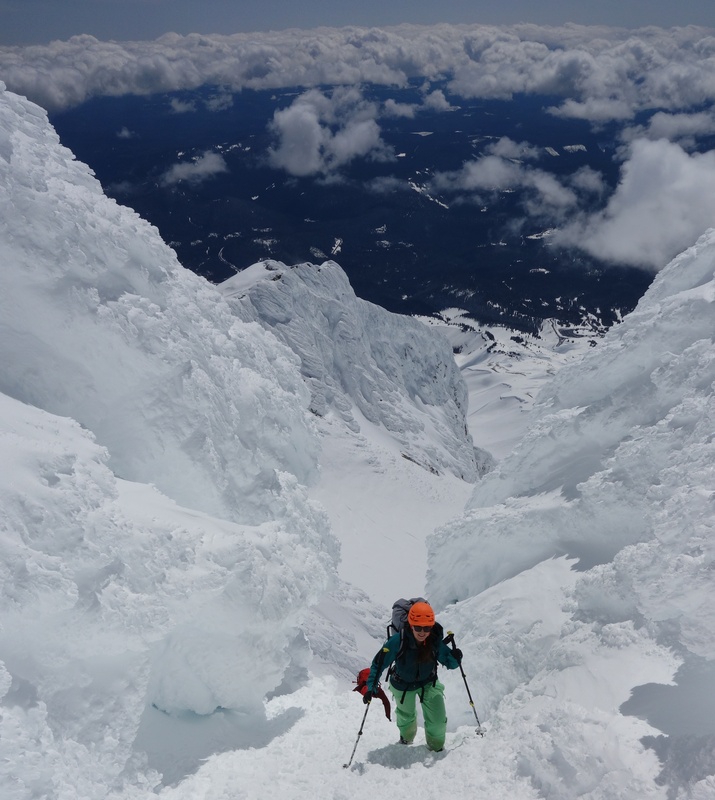 We found that we didn’t need to use our ice axes, and maybe didn’t even really need our crampons. Much to our delight (and surprise), we manged to reach the peak, despite the late, late start! 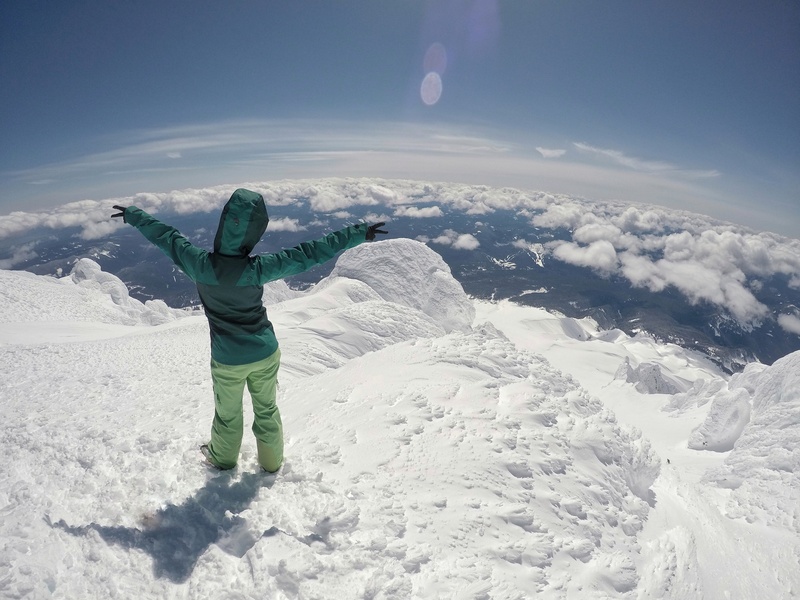 High above the clouds we rejoiced our successful summit. 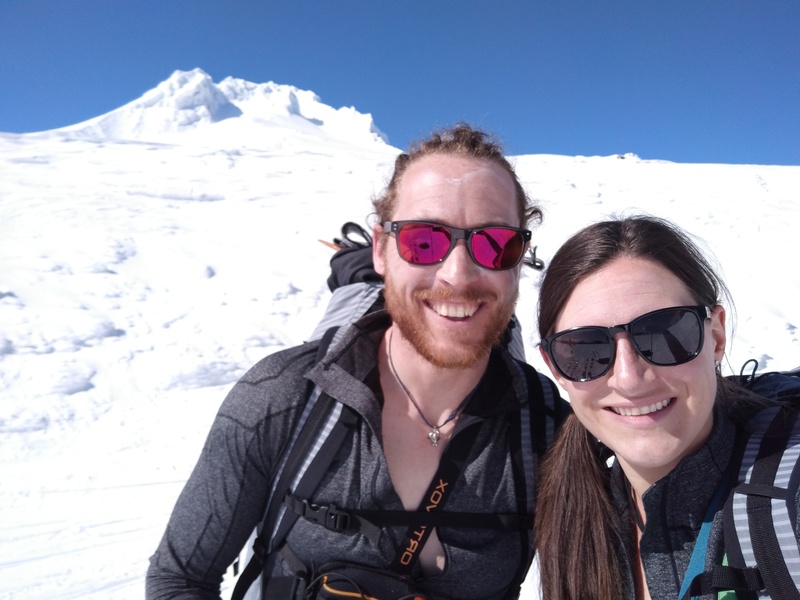 Although we encountered many obstacles and barriers to get to this point, we persevered through our hurdles and were rewarded with a beautiful, calm, clear afternoon on the summit. 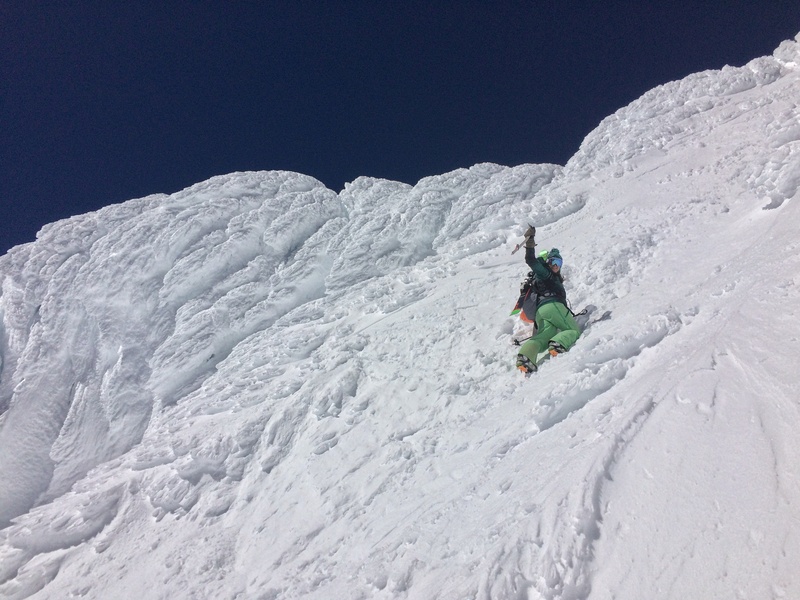 Finally, the only task remaining was to ski down. 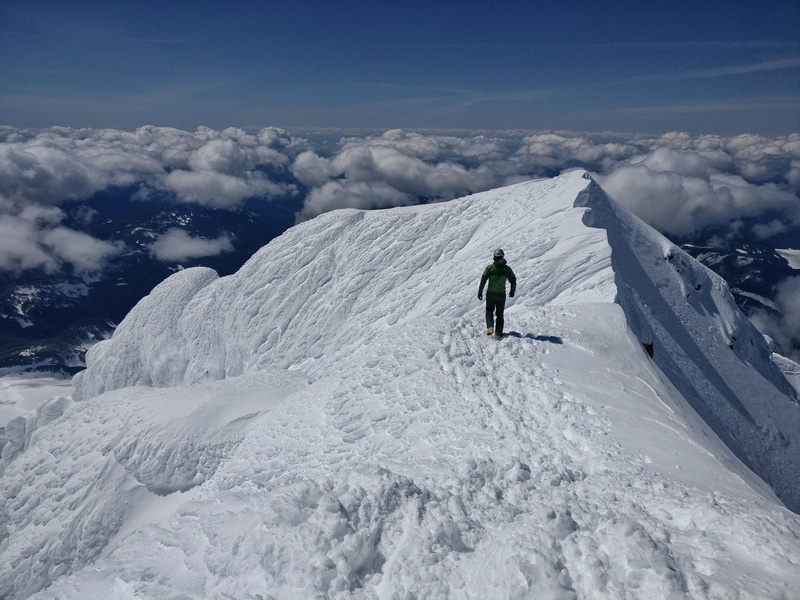 We traversed the summit ridge for some time and decided to descend via a different route than the one we’d climbed. 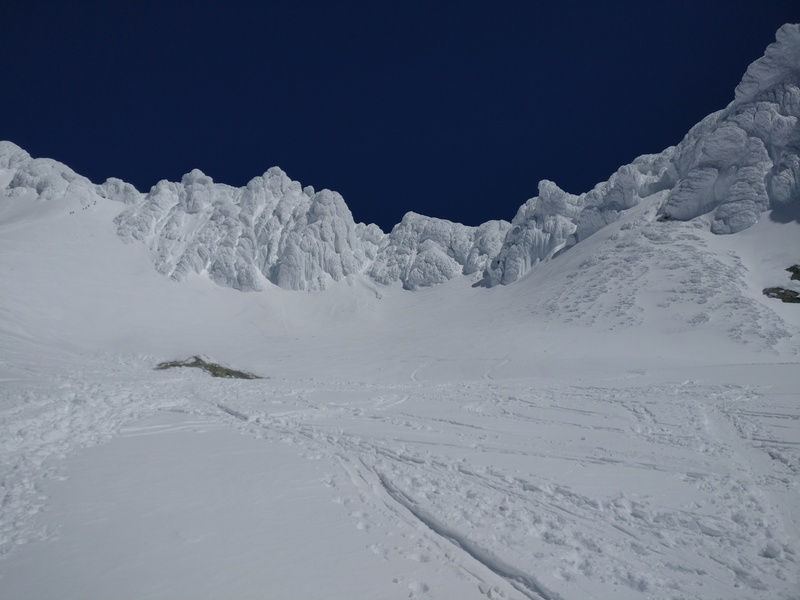 Down the “old chute” and around the other side of the crater rock, we were thrilled to shred a fun, powdery ~1600m descent. 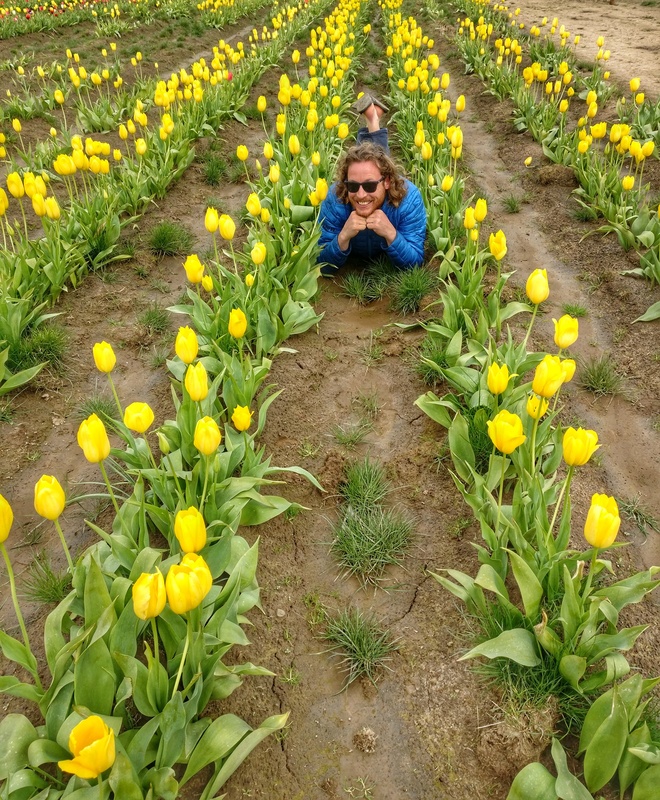 There is nothing more fun than enjoying the fruits of your own hard work! Me downclimbing the top portion of the Old Chute. Ian skiing down Mount Hood, with the crater behind him. A party rests below at the base of the Hogsback. In total the full tour only ended up taking us 5.5 hours car-to-car. 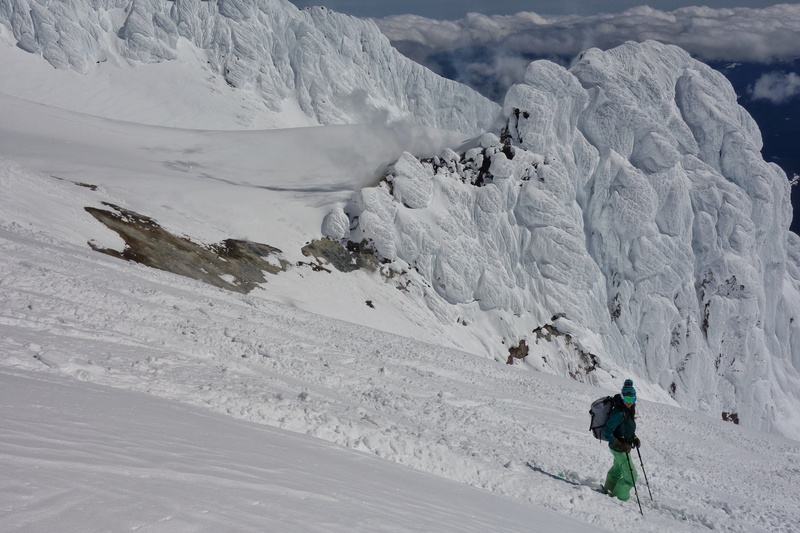 We were lucky that conditions lined up for us because on another day we might not have been able to make such quick work of it, or avalanche conditions might not have cooperated. Thanks for the fun ride, Wy’east! Here’s a video I put together of our footage from the climb/ski. Enjoy! PS we did eventually get our ski bag back from the airline…the day after we climbed Mt Hood. Did you ever get your ski bag and was it intact? Such a pain but it looks like you made the best of it- what an awesome adventure!